A swollen knee can signal either that your knee is just be overused and in need of rest or that you are exhibiting a symptom of a more serious knee injury. Your Manhattan sports medicine doctor treats common knee injuries and provides swollen knee treatment and knee injury treatment to get you back to your normal activity level as soon as possible. To prevent further complications, don’t put off treatment for swollen knee, sports-related knee injury swelling treatment or cartilage injury knee treatment. Come to our sports injury clinic to get your knee pain evaluation and treatment. As the largest joints in your body, your knees carry your weight and provide stability and flexibility for your everyday movements. They are the focal points of your upper leg bones (femur) and your lower leg bones (tibia and fibula), as well as the discs (menisci), ligaments, tendons and muscles. Inside your knee joint, articular cartilage covers the bones to absorb shock and provide a smooth, gliding surface. Swollen knees and the need for cartilage injury knee treatment aren’t just the bane of the elderly. Daily wear and tear can eventually lead to common knee injuries and unfortunate knee pain. Overuse or an injury during sports or recreational activities also sets the stage for potential short-term or long-term issues. Given the fragility of your knees, you have plenty of reasons to develop a relationship with your Midtown Manhattan sports medicine and pain management doctor. Some individuals are more susceptible to common knee injuries. They require treatment for swollen knees from a medical professional. Risk factors that can result in pain and other symptoms include genetics, playing high-impact sports and a work environment that includes heavy lifting. A previous knee injury may have weakened your knee and the surrounding structure, making you more susceptible to future injury. Repetitive motions in a work environment or training regimen can also make you vulnerable to knee injury. And of course, as you age, you may experience wear and tear or be diagnosed with osteoarthritis. Honest communication with your pain specialist about family history, previous injuries and specific details about your discomfort help pinpoint the most effective knee injury treatment. Because of the number of possible causes for your discomfort, your NYC pain specialist carefully questions your medical history and family background. He asks extensive questions about when the injury took place and how your knee was hurt. Then your doctor thoroughly examines your knee, noting any change to the blood or nerve supply of your leg and foot. In addition to the physical exam, your NYC physician may request imaging tests, such as an x-ray, computed tomography (CT) scan or magnetic resonance imaging (MRI). Recovery time from knee injury swelling treatment depends on the severity of the injury and the treatment for swollen knee your doctor decided on. A sprain or strain may resolve in a few days to a few weeks, whereas ACL surgery takes several months to fully heal. Prevention and aftercare following any kind of treatment for swollen knee in NYC includes developing strong muscles to stabilize your knee joint, as well as routinely stretching or yoga for flexibility. Proper footwear helps protect your knees, too. 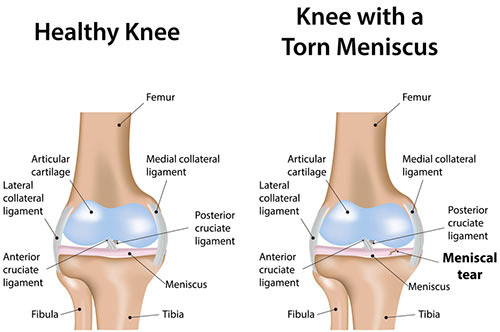 Do you have any questions about the knee injury treatment we offer in NYC? 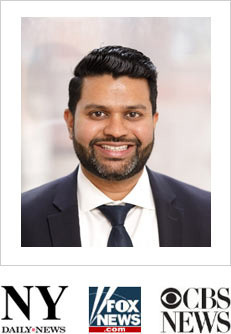 Would you like to schedule an appointment with the best rated knee pain management doctor Febin Melepura MD of New York sports injury clinic? Please contact our office for consultation with the pain relief specialist in Midtown Manhattan.